Lottery News / Powerball / World Game — Comments Off on Asteroid Hitting Earth More Likely Than Winning Powerball? Asteroid Hitting Earth More Likely Than Winning Powerball? Brace yourselves – the asteroid that narrowly missed the Earth back in September is coming back for another pot shot. 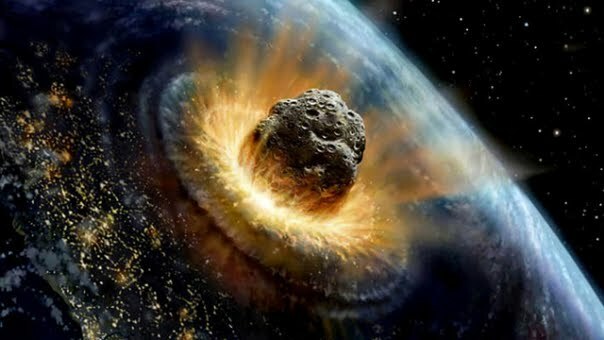 Experts have estimated that the chance of the planet getting hit by Asteroid 2013 TV135 in 2032 is “better than that of winning the Powerball”. However, with twelve Powerball jackpots won and zero Extinction Level Events so far this year, we at LotteryWorld think these experts should check their facts! Although the odds of winning the jackpot seem incredible at 1 in 175,223,510, the simple fact is that players do win. Although last night’s results saw no one match all six numbers for the ninth time in a row, we’d remind players that it has only been a little over a month since an anonymous man from South Carolina secured a whopping $399.4 million jackpot after he purchased a handful of Powerball tickets instead of the hotdog buns he originally went to buy! Despite no one winning Saturday’s $186 million jackpot, six lucky players from California, Florida, Illinois, Missouri and Pennsylvania did manage to match five main numbers to win $1 million each (the Californian winner took home $541,955 due to the pari-mutuel prize system). Saturday’s rollover means that the Wednesday jackpot is estimated at an incredible $216 million, which is the tenth time so far this year that the Powerball jackpot has rocketed past the $200 million barrier. So, in the unlikely event that astronomers are right and the asteroid is hurtling towards Earth, don’t let that put you off buying your Powerball tickets – as $216 million would buy a heck of an end of world party for 2032! Don’t forget, the first Mega Millions draw incorporating the new changes takes place this Tuesday, with a jackpot of $55 million at stake. The new format offers larger starting top prizes, faster growing jackpots and better odds of winning a prize all for the same tiny price of $1! The Camelot Groupâ€™s North American subsidiary is one step closer to becoming the private manager of the Pennsylvania Lottery – making it the third US state to do so along with Illinois and Indiana â€“ saying they can generate $34 billion in profits. The Corbett Administration has issued a â€œnotice of awardâ€ to Camelot, which at this stage is not binding, for a 20 year contract.Â The next step is for the disclosure of the contractual details to the Senate Finance Committee.Â The committee will collect information about Camelotâ€™s bid and will be able to address all contractual procurement questions â€“ then at a later date determine what is in the best interest of Pennsylvania. Council 13 of the American Federation of State, County and Municipal Employees have filed a lawsuit seeking to block any privatization agreement.Â David Filman of the union said. The Pennsylvania Lottery began on March 7, 1972, with a 50-cent ticket twice weekly draws and a grand prize of $1 million.Â It is the only state Lottery that allocates its proceeds to programs that benefit older residents â€“ contributing more than $22.6 billion.Â In just the last year alone, the Pennsylvania Lottery generated more than $1 billion in PA Lottery benefits for those programs. To find out more about the Pennsylvanian Lottery and other US lotteries such as the powerball and Mega Millions or just to get the latest results try the Lottery.net. Editorial comment – not only is this one step closer to Camelot having a foothold in the US it could be the first step towards UK and European lottery players being able to buy into the massive multi-state lotteries of the Powerball and Mega Millions. Who knows, may be even a World Lottery? Lottery NewsÂ and Results from around the world. The Spanish LoterÃ­a del NiÃ±o 2013:Â aÂ total of â‚¬840 million ($1.1 billion) has been paid out in this year’sÂ LoterÃ­a del NiÃ±o (The Child Lottery), which is named after the baby Jesus and is second only to the LoterÃ­a de Navidad with a prize fund of over â‚¬2 billion.Â The draw takes place on the Feast of the Epiphany, SundayÂ 6th January 2013 a day which according to tradition the baby Jesus was visited by three kings bearing gifts. The â‚¬2 million first prize has been won by ticket number 30875 and has been shared amongst winners from five regions, Alicante, Leon, Madrid, Murcia and Tenerife. The second prize of â‚¬1 million has been won by ticket number 46 674, sold in the towns of Albacete, Banyeres de Mariola (Alicante), Almeria, GuareÃ±a (Badajoz), Cala Ratjada ( Mallorca), Palma de Mallorca, Badalona (Barcelona), Torrelavega (Cantabria), Azuqueca de Henares (Guadalajara), San Emiliano (LeÃ³n), Madrid, Murcia and Valladolid Lugo. A whole ticket for the LoterÃ­a del NiÃ±oÂ is made up of ten parts, each with the same number.Â Players can buy any number of parts for â‚¬20 each or they can buy the whole ticket for â‚¬200. Â A common way to play is to buy a whole ticket as a family, friend or co-worker syndicate. The first prize winning ticket is worth â‚¬2 million, thatâ€™s â‚¬200,000 for each part.Â If one person owns the whole ticket, all ten parts, then they will receive the whole prize.Â If the ticket is not owned by a single person then each part receives â‚¬200,000 for every part of the ticket they own â€“ one part = â‚¬200,000; 2 parts = â‚¬400,000, 3 parts = â‚¬600,000 and so on and so onâ€¦The odds of winning a prize are very good withÂ 1 in 3 ticket holders guaranteed to win something. However, there is a catch this year.Â Due to austerity measures put in place by the government intended to stimulate Spain’s economy, anyone who wins above â‚¬2,500 has to pay 20% income tax on their winnings.